Naturally Occurring Radioactive Materials in Construction (COST Action NORM4Building) discusses the depletion of energy resources and raw materials and its huge impact not only on the building market, but also in the development of new synthetic building materials, whereby the reuse of various (waste) residue streams becomes a necessity. 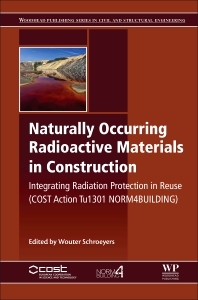 It is based on the outcome of COST Action TU 1301, where scientists, regulators, and representatives from industry have come together to present new findings, sharing knowledge, experiences, and technologies to stimulate research on the reuse of residues containing enhanced concentrates of natural radionuclides (NORM) in tailor-made building materials. Chapters address legislative issues, measurement, and assessment of building materials, physical and chemical aspects, from raw materials, to residues with enhanced concentrations of natural radionuclides (NORM), processes, building products containing NORM, and end-of-life and reuse requirements. Wouter Schroeyers is a professor in Nuclear Technology at the Faculty of Engineering Technology at Hasselt University. He is the head of the educational management team for the master in Nuclear Technology. He is a radiation expert linked to the Nuclear Technological Centre, part of the Research Institute Centre for Environmental Studies. As a radiation expert he specializes in practical radiation protection in the non-nuclear industry, in particular on industries that are dealing with naturally-occurring radioactive materials (NORM). His Research interests include environmental and materials recycle related research and the development and application of nuclear measurement methods. He is also the Chair of the COST Action TU 1301 ‘NORM4Building’.